The Definition of Dope Acid Jazz. Fresh loops mixed with talented live players = Greyjazz. Enjoy. 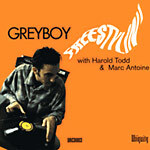 All songs produced by Greyboy.